Corporal 200865, 'D' Battalion, Tank Corps. Formerly 32209, Machine Gun Corps. Killed in action 9th October 1917, aged 20. No known grave. Commemorated on the Tyne Cot Memorial, Zonnebeke, West-Vlaanderen, Belgium. Panel 159 to 160. Son of Mr Frederick Charles and Mrs Lucy White of Castle Rest, Kenilworth. I am very sorry to have to inform you that your son Dudley, the finest and bravest boy I have ever met, was killed in action on the 9th of this month. He was in my own crew, and we went into action at dawn on that morning against some strong points at Poelcapelle. From the start we were shelled heavily, and about 8.30 a shell struck the “Tank”, killing your son who was at his gun – he was a gunner – instantly. His death must have been painless, for he never uttered a word, being hit along the back and right side. The Corps has lost a brave soldier and my Company a dear comrade with his death and you have our utmost sympathy at this sad blow. Any of his effects he may have left in his kit will be sent to you. 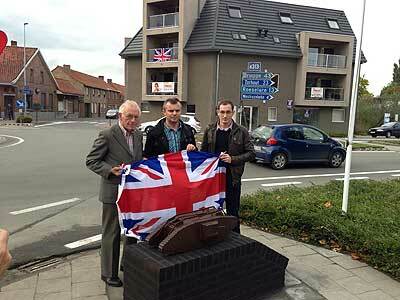 He is buried beside the “Tank” in Poelcapelle, and a braver boy never rests under the Belgian soil. I send the sympathy of the whole Company to you and your family. The tank in its original position when the village was being rebuilt about it. 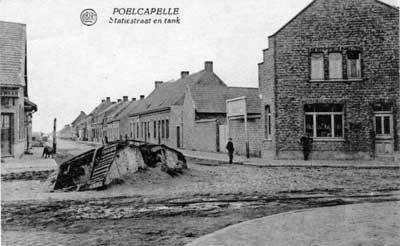 The village of Poelcapelle was almost flattened in the action that took place in the days and weeks leading up to the Battle of Poelcapelle on 9th October 1917. Unfortunately all twelve tanks deployed on that day were lost. 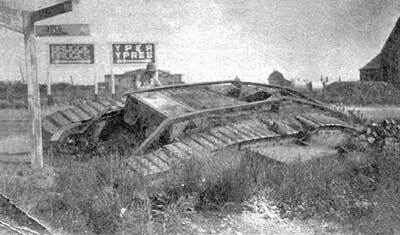 Four took a direct hit and burnt out and eight were irrevocably bogged down in the mud. This area around Poelcapelle became known as a tank graveyard and the 183rd Tunnelling Company were put in charge of dismantling and clearing the tank wrecks. Two tanks, however, were deliberately left. 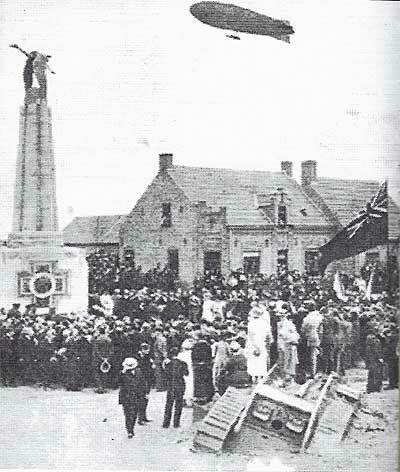 Damon I on the station square at Ypres and Damon II on the market square of Poelcapelle. The reconstruction of Poelcapelle began around the tank. In July, 1923, a new monument to the French pilot Guynemer was inaugurated in the middle of the square with some of the public standing on the tank as a viewing point. 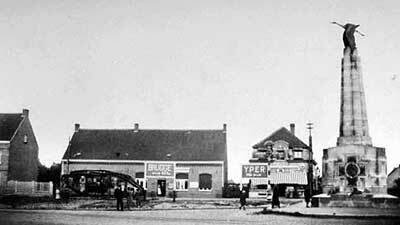 By 1924 because of the construction of the tramway connecting Poelcapelle with Langemark and the increasing traffic of carts and automobiles it was decided to remove the tank and it was put on a pedestal on the marketplace. It now became a memorial as well as a playground for local children, who became known as the “Penny children” as many tourists came to see the tank and would throw pennies to the playing children. Finally the tank was dismantled and taken away by the Germans in 1941 in their need for more iron. In recent years and with the ever-growing interest in World War I, a group of history-enthusiasts from Poelkapelle formed the Poelkapelle 1917 Association (or ‘P1917A’), and it is their dream to have a new tank or replica put back in the village centre, if possible on the spot where Damon II was left after the war. 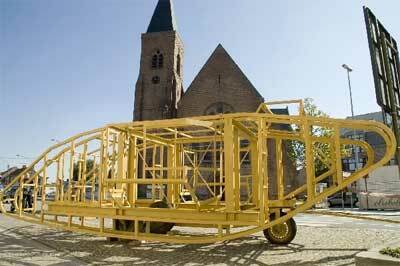 The progress of the development of this replica is reported in the Poelcapelle1917Association blog. Johan asked Susan if it was possible to find any living relatives of Dudley White as each year in Poelkapelle they have a day in remembrance of a particular tank or person and he planned to have a day devoted to Damon II. Susan after several months research was able to make contact with the Hunt family who are second cousins of Dudley. They were very interested and wanted to visit Poelcapelle. The visit took place on the weekend of the 5th-7th October 2012. 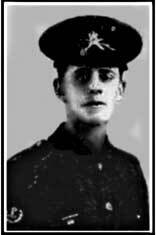 It was attended by six members of Dudley's family and the nephew of his Tank Commander, Lt. Coghlan. 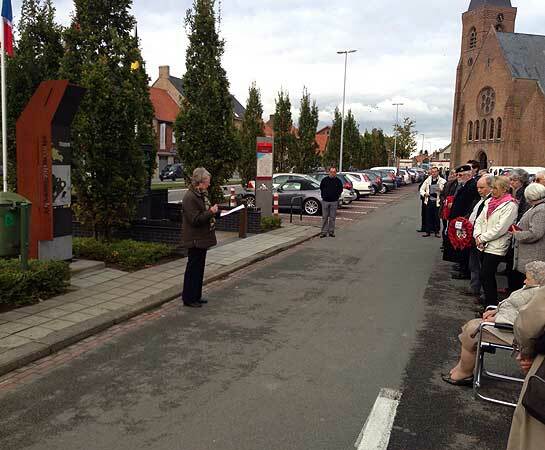 At a ceremony at the Poelkapelle Tank Memorial, a miniature replica of the tank was unveiled. 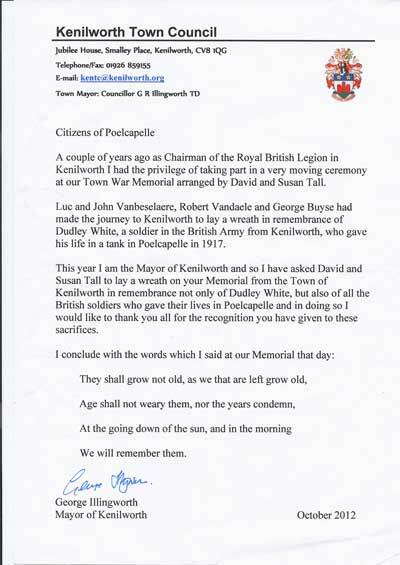 Susan and her husband David took a wreath from George Illingworth, now the mayor of Kenilworth, and Susan read out a letter from him. Many photographs of the visit are here.